The first quarter of the year is now over. How did you do on the health goals you set for yourself at the beginning of the year? If you are like most people, you probably fell off the wagon in at least one area of your life you were trying to improve. One of the best things we love about spring (in addition to the better weather, blooming flowers, and happier people!) is the feeling of a fresh start. April can be a time of renewal for your body, mind, and spirit. If you are looking for some motivation to continue with your health goals, look no further than the reset this dramatic change of season can offer. Here are 3 ways you can make the most of this fresh start. Let go of the critical and condemning thoughts about not being as far along on your health journey as you were hoping to be. Still carrying extra weight? Still not into a consistent exercise routine? Still letting stress play a role in your life? Let it go. Just breathe and let it go. Nothing positive will come from a place of shame. You have what it takes to make the changes in your life you feel are necessary. If you’ve written down your goals, now is the time to take a look and really determine if you were realistic about what you hoped to achieve. A lot can happen in three months so if your life circumstances have changed significantly, your goals may need to be altered. Having to revise your goals throughout the year is not failure. Rather, it is a demonstration that you are in charge of your priorities and can course-correct when you need to. Sometimes as human beings, we have to see it to believe it. Once you demonstrate to yourself that you are a person of action by taking that one small step (going for a walk at lunch, eating a healthy dinner, getting in regularly for your chiropractic adjustments), it will be easier to believe it and your future decisions will fall in line with your new vision of yourself. 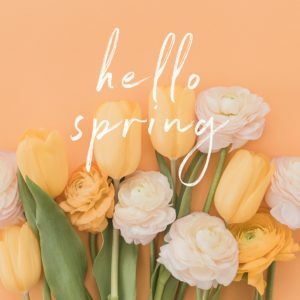 Our hope is that you will feel encouraged to make the most of this beautiful time of renewal, continue pursuing your health goals, and move forward in achieving your dreams.